One week every summer in July, Oshkosh becomes the venue for an airshow of truly epic proportions. The event is formally known as the EAA Airventure Oshkosh. EAA stands for the Experimental Aviation Association and it is based in, you guessed it, Oshkosh, Wisconsin. The EAA was founded way back in 1953 by a group of aviation enthusiasts in Milwaukee, Wisconsin. The first Fly-In convention was held in the same year. Since then, the convention has grown and includes everything that has anything to do with aviation. By 1970 it had to transfer to a bigger venue, its present headquarters in Oshkosh, Wisconsin. For the one week (just one week!) the airshow is on, this relatively small regional airport in rural Wisconsin sees between 10,000 and 15,000 aircraft movements and up to a million visitors (that's as much passengers Cebu Pacific gets in a month). Instead of tickets for entry we get wristbands. 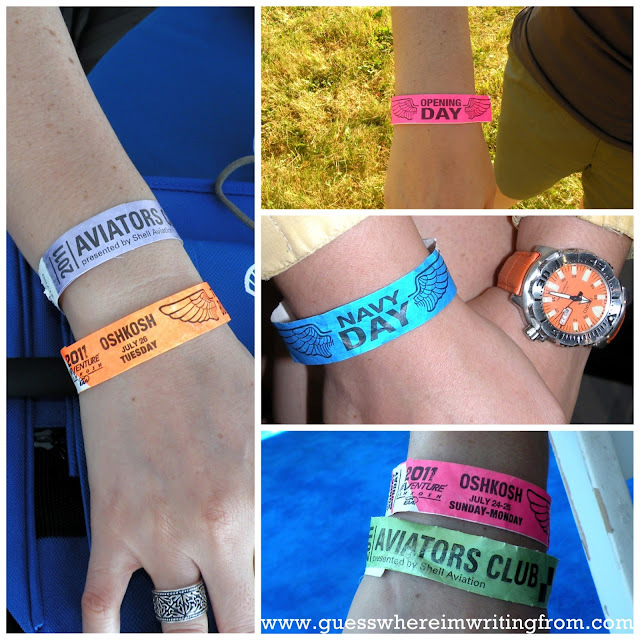 Each day a different colored wristband is given to visitors. Fifi, the last of the B-29s still flying. It was nicknamed the Flying Superfortress. One well-known B-29 was the Enola Gay that dropped the atomic bomb "Little Boy" on Hiroshima in August of 1945. To the small. The Sky Baby was built in 1952 by Ray Stits to claim the title of the world's smallest bi-plane with a 7' 2" wingspan. An NBA center is taller than this plane's wings are wide. And smaller still... Although all this one does is taxi around. the F-18 Hornets of the Blue Angels, the US Navy's aerobatic team. US Navy's Sea King helicopter. The legendary Tuskegee Airmen's P-51 Mustang. This World War II P-38 fighter plane was nicknamed the Glacier Girl after being buried in ice for 50 years. T28 Trojans, 1950s-era military trainers. The Jelly Belly plane. The roof of the white van at the back is her mobile landing pad. Duggy the DC-3 "Smile in the Sky". We also had the once-in-a-lifetime experience of seeing two of aviation's legends up close and personal. Gen. Chuck Yeager, the first pilot to travel faster than the speed of sound. Bob Hoover, a former US Air Force test pilot and considered as one of the founding fathers of modern aerobatics. He was also named by the Air and Space Smithsonian as one of the top pilots in history. World's fastest jet truck. I guess it really was the world's fastest since we only got to take a picture of the smoke it left behind. For the big K and I it was a good though a bit pricey decision to avail of the EAA Aviators Club, an air-conditioned tent adjacent to the flight line. It was a wonderful respite after walking around the huge grounds in the middle of the summer heat. Free lunch, snacks and drinks all day. And what sealed the deal for us was their own flushing toilets! Let's see you use those public porta-potties after being under the heat of the sun for quite some time. The University of Oshkosh where the big K and I stayed. Pretty cheap, basic accommodation. Good enough. If you have any interest whatsoever in aviation, you have to at least consider a trip to Airventure Oshkosh. Regardless of what kind of aircraft you like you'll definitely find something to see. Everything and anything that flies finds its way to Oshkosh. Another great entry. You're so well traveled! Thanks, Maita! Working in the airline industry definitely makes you appreciate travelling. Porta potties are definitely a "pheee-ew" in the heat. LOL!